I am a keen follower of Spanish football, having been a Barcelona fan for many years but I can’t help hide my jealousy when it comes to their wealth of goalkeepers. Whilst watching the Athletico Madrid versus F.C. Barcelona fixture on Sunday evening, the next generation of goalkeepers to fall off the production line, showed his immense potential (De Gea). Over the years we have seen some amazing goal-keeping talent in the Spanish national side, namely Andoni Zubizarreta (pictured above) and later the dyed locks of Santiago Canizares, both excellent goalkeepers, captains and leaders. 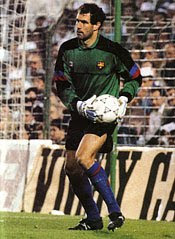 It can be argued that since Zubizarreta made his debut back in 1985, Spain have not had to worry about the goal-keeping position, he went on to collect 126 caps for Spain. The current crop it can be said, have a lot to live up to from Zubizarreta and Canizares (46 caps), but they are making a name for themselves, with apparent ease it seems. The names should roll off most football fans tongues. Iker Casillas – Aged 28, pictured below, arguably the best goalkeeper in the world alongside Gian-luigi Buffon. Has been Real Madrid #1 since aged 17 and possesses over 100 international caps for Spain. How the rest wish he hadn’t been around!! Pepe Reina – Aged 27, well-known to English football fans as Liverpool’s excellent shot-stopper. Vastly improved since his move to the English game five years ago. The former Villerreal and Barcelona keeper has only 19 international caps due to the man above. Diego Lopez Rodriguez – Aged 28, the former Real Madrid man has only one international cap due to his late development. A fantastic leader of his defence, who did not miss a minute of league football last season as Villerreal finished 5th. A personal favourite of mine. Victor Valdes – Aged 28, goalkeeper in the greatest team of our generation (Barcelona 2009) yet he has never been capped by the national team. Has caps for Catalonia to compensate. He’s a vastly improved keeper who would have made many international appearances for many national teams. David De Gea – Aged 19, pictured below, the new breed to keep the above on their toes. Only six first team starts for Athletico Madrid but he was fantastic versus Barcelona. Already capped at under 21 level and he is keeping the under 21 first choice out of his club team at the moment. Sergio Asenjo – Aged 20, the current Spanish under 21 international has made a fantastic start to his career but has recently lost his place to De Gea. Has the potential to be a great in the game but he has a generation’s worth of fighting on his hands to achieve it. Then we shouldn’t forget the fine form of Andres Palop (Sevilla) or Cesar Sanchez (Valencia), both in fine fetal in the twilight of their footballing careers, aged 36 and 38 respectively. I am very jealous! The Spanish football fan is spoilt. To back this up; only 6 teams in La Liga (Spanish top-flight), have non-Spanish nationals as the first choice goalkeeper, yet in the English Premier League we have only 6 teams with English goalkeepers as the first choice between the sticks. Says a lot in my opinion. Finally let us not be too judgemental on our Spanish counter-parts, they have shared the goalkeeper wealth with the English game, as we are allowed one from their goal-keeping union. Only problem is, Manuel Almunia is possibly 9th choice for the Spanish national team and with that in mind he understandably wants to play for the English national side. Thanks Spain we appreciate the offer, but no thanks. Cheers for reading as usual. It is true that Spain has been producing strong and talented goalkeepers and De Gea is just the latest. He reminds me a lot Casillas not so much in their styles, but in their story which is very similar. Both from youth academies from Madrid, both finding a spot in clubs were there is constant pressure, and so forth. I’m a Madrid fan but I’m paying close attention to this kid who promises a lot. Thanks for your comment, Casillas is arguably the one thing as a Barca fan I admire with Madrid. He is amazing and very loyal. De Gea has so much potential and he has been amazing when I have seen him play. I really like Diego Lopez too, amazing leaders these keepers prove to be too. Would love to see the same development with English keepers!! I have a new blog address which is http://www.gafferssportsblog.co.uk/ so bookmark it for future reference.